Ken & Sujai started their story on the Fourth of July weekend in 2013, on the wedding of Ken's brother. Stunned by her beauty, it took him until a couple hours later to strike up a conversation. After that, they kept the conversation going until it was time for Kenneth to return to his state. After that, they endured a challenging long distance relationship that, although difficult, brought them even closer. Eventually, they got engaged, decided they'd be getting married in Puerto Rico, and that's when they meet me! After facetime calls, lots of back and forth e-mails, they settled on their date and we started planning. We finally met on a warm August day for their engagement session, while they were on the Island for wedding planning purposes, and we even synchronized the photo session with the hair and makeup trial, so Sujai looked gorgeous! Finally, almost a year later, the day was finally here, and it promised to be intense! So we arrived early to the Condado Plaza Hotel for the couple's getting ready photos, with an unusual team of three: two cameras and an assistant. For most weddings, I'm the only camera documenting the event, since I've trained myself to be quick on my feet, schedule the logistics beforehand, and being intentional in the documentation of each part of the day. So for 90% of my weddings, it is just me and my assistant. However, there are particular wedding days that seem to be challenging on the logistics or too complex of an event for it to be comfortable having just one camera, so I hire an extra camera for this purpose. I loved how the Condado Plaza rooms matched perfectly with their red color palette. During their getting ready portraits, both Sujai and Ken looked amazing but a tad nervous, so I kept a low-key profile, mostly documentary, until their first look portraits so as to make them feel at ease. All this nervousness faded the instant Ken turned to see Sujai on their first look. They practically forgot there were cameras around. Happy me! We had divided their portrait session in two: as we would be doing some portraits around Old San Juan during the cocktail hour in a much more favorable lighting situation. So, after their first set of portraits, we hopped in the cars, making our way to Casa de España. 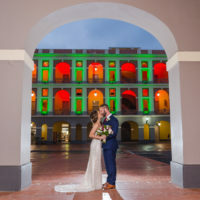 They held a very emotive and special ceremony on the outdoor patio of Casa de España, after which we quickly escaped for the portrait session in Old San Juan. Traffic was difficult that day, so we drove to one location, where the wedding party joined us for an extended portrait session. After their portraits were done, we were left alone with the newlyweds for their second set of portraits. When we came back to Casa de España, guests were waiting for us in the grand ballroom. The wedding party started the protocol with a choreographed entrance followed by emotional toasts. A musical quartet entertained us through a relaxing and romantic rest of the night. During the night different guests took the microphone and entertained us with musical collaborations. I'm definitely not used to this much talent in one room! Forever thankful for the opportunity to capture this day, and I hope it's not the last time I have this lovely duo in front of the lens.